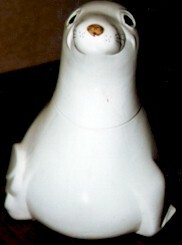 Sammy the Seal cookie jar by Metlox Pottery. This is the most sought after metlox cookie jar. It is so rare that there are very few known pieces in the Metlox world. Marked "Metlox Made in USA".